Midplains Ag, UNL Extension, and Nebraska Soybean Board are happy to have Olivia Kellner of Climate Impact Company speak at our 2nd annual Irrigation field day. Come join us to hear about “Using Weather Forecasts to Manage Farm/Fields”. She will be discussing the long-range forecast and how to utilize forecasts in general. Olivia Kellner is from a small rural community outside of Indianapolis, Indiana. She earned her B.S. in Operational Meteorology and Climatology in 2008 from Ball State University, her M.S. in Atmospheric Science from Purdue in 2011, and her Ph.D. in Atmospheric Science with a focus in applied climatology and agriculture from Purdue in 2015. While in graduate school at Purdue, she worked under the guidance of Indiana’s State Climatologist, Dr. Niyogi, and has been actively involved in applied climate outreach since 2013. Olivia joined Climate Impact Company as a climatologist in 2015. She has also worked for the National Weather Service as an Intern Meteorologist, as Staff Scientist at an environmental consulting firm, and as a climatologist for the Midwestern Regional Climate Center and the Illinois State Water Survey. 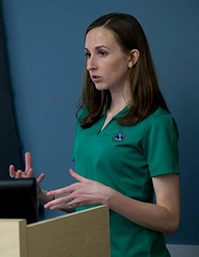 Her research interests include agricultural meteorology and climatology, severe convective weather, land-surface interactions, and climate science education. Through her outreach, she hopes to the share basic science behind the earth-atmosphere system so that individuals can better understand the impacts their actions have on the natural climate system. Come join us August 30th at Holdt Farms and Midplains Ag 3 miles south and 5.5 miles west of Elgin on 836th Rd. We will be having free ice cream provided by Cabin Realty & Ag Services of Burwell. Lunch sponsored by the Nebraska Soybean Board will be provided by Badang Catering of Orchard. Check out webpage Irrigation Field day 2017 to learn more about what is planned for the day.